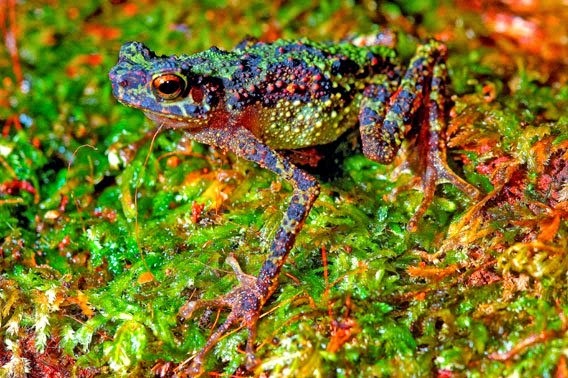 The Bornean rainbow toad rediscovered after 87 years! The Bornean rainbow toad is a rare species of frog that has remained unseen since its first discovery in 1924. Now, 87 years later, a team of researchers from the Universiti Malaysia Sarawak announced that it has managed to find and take photos of three specimens. The research team was led by Dr. Indraneil Das. Prior to the rediscovery, the little knowledge we had about the species came from a black-and-white drawing from the 1920s! The researchers located and photographed the three specimens in the high branches of a tree, after spending many months searching for the species. The discovery was made in a still undisclosed location, somewhere between Malaysia's Sarawak state and Indonesia's Kalimantan Barat Province. To locate the species, the team used data from other closely species to estimate where and when the species would most likely occur. From this information, they concluded it was best to search during the night, along the streams and up on the trees. Months later, their effort was paid as they spotted three individuals, up on a tree, two meters (six feet) high. The three frogs comprised of an adult male, an adult female, and a juvenile. The team decided to not unveil the exact location of the discovery to protect it from poachers and pet trade suppliers. The body is multicolored, with unusually long and skinny limbs. They have a pebbly back, covered with bright red, green, yellow, and purple warts. Most probably, the toad's colorful appearance serves as a warning signal (Aposematism) to potentials predators that it is poisonous and toxic if eaten. Furthermore, the skin is rough, indicating the presence of poisonous glands. The three specimens had a varying length, from 3 to 5 cm (1.2-2 inches). The juvenile was the smaller, and the female the biggest. The species is believed to live in Indonesia and Malaysia, in subtropical or tropical moist lowland forests and rivers. The only thing we can with some certainty is that the species inhabits high elevated places using its moss-like appearance as a camouflage against predators. Currently, we have no exact data regarding the Bornean rainbow toad's populations. This beautiful animal is listed as endangered by the IUCN, with the main threats being habitat loss and degradation mainly as the result of logging. Unfortunately, there are currently no laws protecting its natural habital and with the rediscovery made public, there are serious concerns that pet trade suppliers might be tempted to come and collect specimens. - In 2010, the Conservation International and the International Union for Conservation of Nature's Amphibian Specialist Group, made a list of 10 frog species that were presumed to have gone "extinct". The Bornean rainbow toad is only the second species to have been found since then. 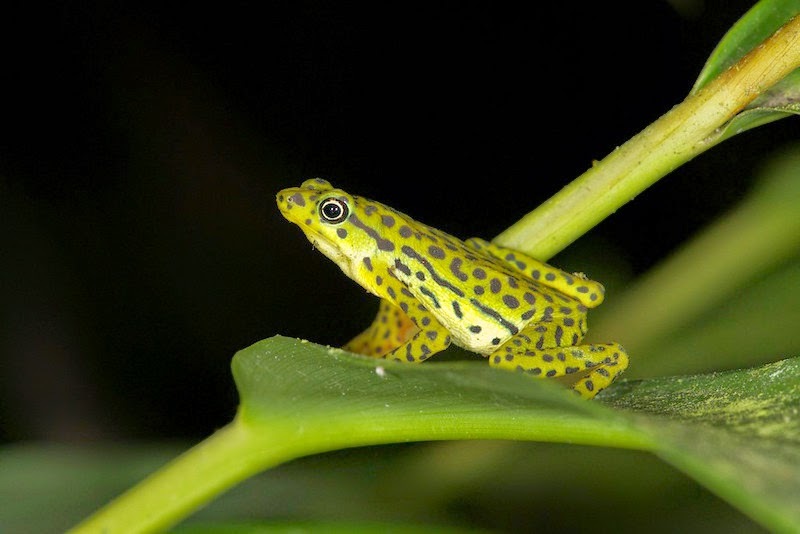 The other is the Rio Pescado stubfoot toad (Atelopus balios), which was discovered by Eduardo Toral-Contreras and Elicio Tapia, in 2010, 15 years after its last sighting.